The Land of the Sirens in one of the most beautiful areas in the world. It goes from the Sorrento Peninsula to the Amalfi Coast. According to a legend the Sirens lived along this coast and their haunting and beautiful voices lured passing marines onto the rocks. Fascinated by the beauty of the area was the world famous dancer Nurayev, who owned the “Li Galli” isles, also called the Mermaid Islands; its guests also included Picasso, Stravinsky and the dancer and choreographer, Leonide Massine. This area has a spectacular coast line, with many little bays and grottos to discover by boat. At the end of the Sorrento Peninsula is Massa Lubrense, surrounded by olive and lemon trees. Part of it, the wild and craggy Punta della Campanella, divides the Bay of Naples from the Gulf of Salerno and is not only beautiful but also full of history. From Massa Lubrense there is one of the best views across to the island of Capri. Capri itself is legendary for its beauty. If you sail around this island, you will be impressed by what you see and understand why this island has become so famous in the world. A land stretched out towards the Mediterranean, a land that was painted, described and sung by poets, artists and great travellers of all ages. An alternation of indented and inaccessible coasts dominated by guard towers, pleasant and sweetest beaches, protected inlets and enchanting grottoes and bays. This land was inhabited and loved by Man since the ancient times: the Greeks had been so fascinated by it to imagine that in these seas lived the Sirens, whose singing was impossible to escape from. Not even the Romans resisted the myth, perpetuating the fame of its thousands of beauties and endless natural resources. They traced there a road that crosses it as far as the extreme end of Punta Campanella and built landings, fish-ponds, nymphet and thermal basins on the sea to exalt their sumptuous villas, such as that of Pollio Felice, whose ruins evidence its grandeur. In the Middle Ages and in the modern age, the population, relying on the spirit of cultural exchange, did not fear the Saracens and never withdrew from the sea, continuing to live in the wonderful sea-shores: Marina di Aequa, Marina Grande, Marina della Lobra. In the lanes of the old city centre, still untouched in spite of the progress and mass tourism, have survived churches and ancient monasteries, keepers of valuable memories. Centuries old palaces and Durazzo portals evidence the splendour of the noble families of Sorrento. Via S. Cesareo, the lively "decumanus", is the beating heart of the town, with its many-coloured shops, where tourists from every part of the world crowd. But the real architectonic jewel of the town is the fourteenth century Cloister of San Francesco, with crossed tuff arches of Arabian derivation, where the traditional concerts of the "Estate Musicale Sorrentina" take place. The region Campania is one of the most beautiful regions in Italy. It has an abundance of natural beauties, archaeological sites and a long tradition of excellent food. Walking is a great way to discover this area and meet its warm and friendly people. Our tour will take you away from the areas of heavy-duty tourism into another world of ancient lands full of history and towns hemmed in by lemon groves. We will let you discover the spectacular views as you walk along the famous path of the gods along the Amalfi coast into the valley of the mills. You will also visit the lovely town of Massa Lubrense that was founded by the Lombards and hemmed in by flower-filled fields of lemon and olive trees. Each visitor should complete the holiday on Amalfi Coast with an excursion on the famous pathway called ‘Sentiero degli Dei’, so called because of its fantastic position half way between the sky and the sea. It rises on average at around 500 metres above the sea level and the view is particularly stunning from Praiano and Positano. 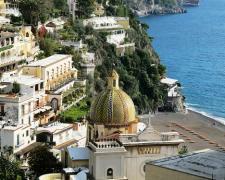 Amalfi is famous all over the world for its glorious past and for the sea. Only a few people, however, have visited its charming jewel: the natural reserve called “Valle delle Ferriere”. Botanists know this reserve thanks to the presence of a plant which is very rare in Europe, the Woodwardia radicans from Tertiary Age and which represents a rare example of pre-glacial flora. The Ferriere Valley Nature Reserve, instituted in 1972, in the Scala local council territory behind Ravello, constitutes the only protected area on the whole Amalfi Coast. In the middle of this path there the ancient ironworks factory that gives its name to the valley and which provided iron to the ancient Republic of Amalfi. Since the path is easy, there is no need to use special tools or equipments: it is important to wear long trousers and comfortable shoes, fit for mountain walking. The most important thing to remember is to bring a camera to take beautiful photos. Forgetting it would be a great mistake! This is an example of itinerary which unites sacred and profane: the breathtaking panoramas over the Gulf of Salerno and over Amalfi Coast, and the search for the divine favoured by the long walks up to the Sanctuary dedicated to Our Lady, the Protectress. Then, the wide areas over the sea and the stunning views naturally lead the visitor to contemplate the Infinity. The Madonna Avvocata Sanctuary, situated on the Falerzio Mountain on a rocky wall, can be reached using a mule track that leaves from the Abbey in Cava de' Tirreni (this is a longer, but less difficult way) or from Maiori using a long staircase from Maiori. Each Monday after Pentecost, pilgrims from Cava de' Tirreni and Maiori walk to the Sanctuary to celebrate the cult of Our Lady the Protectress. The largest public park in Sorrento, the Villa Comunale sits on a cliff top overlooking the entire Bay of Naples and offers benches, flowers, palms, and people-watching, plus a seamless vista that stretches from Capri to Vesuvius. From here steps lead down to Sorrento's main harbor, the Marina Piccola. A highlight of Sorrento is Museo Correale di Terranova, an 18th-century villa with a lovely garden on land given to the patrician Correale family by Queen Joan of Aragon in 1428. It has an eclectic private collection amassed by the count of Terranova and his brother. The building itself is fairly charmless, with few period rooms, but the garden offers an allée of palm trees, citrus groves, floral nurseries, and an esplanade with a panoramic view of the Sorrento coast. The collection itself is one of the finest devoted to Neapolitan paintings, decorative arts, and porcelains, so for connoisseurs of the seicento (Italian 17th century), this museum is a must. Magnificent 18th-century inlaid tables by Giuseppe Gargiulo, Capodimonte porcelains, and rococo portrait miniatures are reminders of the age when pleasure and delight were all. Also on view are regional Greek and Roman archaeological finds, medieval marble work, glasswork, old-master paintings, 17th-century majolicas—even the poet Tasso's death mask. Near the Villa Comunale gardens and sharing its vista over the Bay of Naples, Convento di San Francesco is celebrated for its 14th-century cloister. Filled with greenery and flowers, the Moorish-style cloister has interlaced pointed arches of tufa rock, alternating with octagonal columns topped by elegant capitals, supporting smaller arches, and makes a suitably evocative setting for summer concerts and theatrical presentations—make this a must if you can catch an event. The church portal is particularly impressive, with the original 16th-century door featuring intarsia (inlaid) work. The interior's 17th-century decoration includes an altarpiece depicting St. Francis receiving the stigmata, by a student of Francesco Solimena. The convent is now an art school, where students' works are often exhibited. Wedding Ceremony in Sorrento Land of colors and delicious perfumes. Sorrento, for a special Mediterranean style wedding. 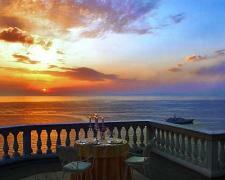 Wedding Reception in Sorrento Many amazing options for a romantic wedding right on the clearblue sea.